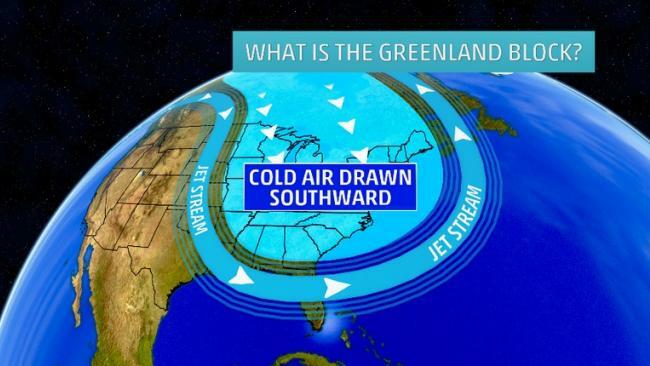 2014-2015 Winter Outlooks: Another Frigid Winter Coming? The eastern two-thirds of the United States, including Southwest Georgia, is predicted to see temperatures as much as 5 degrees lower than average in some winter months, according to forecasters with the Old Farmer’s Almanac. “Across the eastern two-thirds of the country we’re calling it refriger-nation, then you see it turns almost exactly opposite on the (Rocky) Mountain line,” said Janice Stillman, who is in her 14th year as editor the annual publication. In an interview last week, Stillman said that the almanac’s meteorologist told her his computations actually indicated a greater deviation from normal than what he was comfortable with predicting. ##“It could very well be colder than what is printed in the book,” she said. Winter will be colder and drier than normal, with near- to above-normal snowfall. The coldest periods will be in early to mid-December, from late December through early January, and in mid- and late January. The snowiest periods will be in early and mid-January. Re: 2014-2015 Winter Outlooks: Another Frigid Winter Coming? I don't really trust a lot of what the almanacs say. However, the start of fall could be a cool one judging by temps this week. After record-shattering temperatures and high snow totals last winter in the Northeast, a similar theme will continue into the 2014-2015 season. Cold air will surge into the Northeast in late November, but the brunt of the season will hold off until January and February. The polar vortex, the culprit responsible for several days of below-zero temperatures last year, will slip down into the region from time to time, delivering blasts of arctic air. "I think, primarily, we'll see that happening in mid-January into February but again, it's not going to be the same type of situation as we saw last year, not as persistent," AccuWeather.com Expert Long-Range Forecaster Paul Pastelok said. "The cold of last season was extreme because it was so persistent. We saw readings that we haven't seen in a long time: 15- to 20-below-zero readings." In addition to the cold air, a big snow season could be in the offing. Higher-than-normal snow totals are forecast west of the I-95 corridor. "Places like Harrisburg, down to Hagerstown getting into the mountains, the Appalachians, I think that's where you're going to see your bigger, heavier amounts," Pastelok said. Philadelphia, which received a whopping 68.9 inches last season, is forecast to close this season with snow totals just above normal. New York City will likely follow suit. The I-95 corridor and eastward could fall victim to changeover systems, which will provide a messy wintry mix at times. "I'm very concerned about the Tennessee Valley to the Gulf Coast as far as extremes go this year," Pastelok said. Areas from eastern Texas all the way up to eastern Kentucky could be under the gun for ice events this season. The region will likely see this in January, but the I-10 corridor should be on guard for a sneaky late-January or early-February storm. Overall, the region will have a very wet winter, but the timing of these storms will determine whether a flood risk exists. "These are big storms that are going to form and put down a lot of rain, but there may be breaks in between," Pastelok said. "The Gulf hasn't been disturbed from tropical activity, so the warmer waters may hang on into the middle part of the winter and give us that extra boost into some of these systems coming up the East Coast." The weather pattern, a weak El Nino, paired with the southern storm track and rich moisture source will set up Florida for a significant severe weather potential in mid- to late winter. Tornadoes will be possible from mid-January to February. A weak El Nino pattern, which is expected to unfold, may lead to high moisture in the Southwest. "That moisture source is needed to get above-normal snowfall for the region. I do believe there are going to be periods where moisture gets in there," Pastelok said. If it does, the Four Corners region, including Albuquerque, could get near- to slightly above-normal snowfall totals this year. "Northwestern Texas, western Oklahoma, Kansas, they can also see near- to slightly above-normal snowfall this year," Pastelok said. As California suffers through its fourth and most extreme year of drought, the state is in dire need of precipitation this winter. "California, the northern Sierra and Sierra Nevada are going to be below normal, although I do think that they are going to get enough snow to hold back the drought just a little bit from getting any worse than it is," Pastelok said. December will bring some rain to northern California, but the precipitation will ease off in the following months, making the region drier than normal by February. After a season of intense wildfires, the precipitation that reaches the Northwest will not be enough to prevent problems next year. However, the winter isn't all bad news for the drought-stricken region, Pastelok said. The weather pattern will allow some Eastern Pacific moisture to be pulled in, causing some big events which will increase the snowfall rates in the mountains. Additionally, Southern California looks to fare better than its northern counterpart with slightly above-normal precipitation this season, especially in areas farther from the coast. 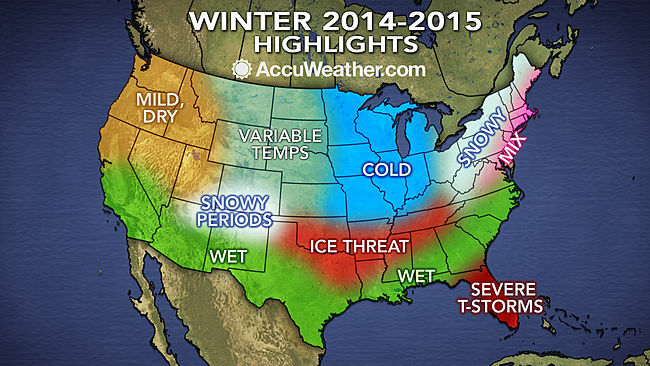 The Weather Channel has issued its winter forecast for 2014-2015, and it looks a bit different from last winter. Compared to 2013-14, which was one of the coldest winters in recent memory in the Upper Midwest, this winter the chill looks to be more focused on the East Coast and Gulf Coast, according to the winter forecast prepared by WSI, which along with The Weather Channel is part of The Weather Company. The forecast, which looks ahead to temperatures from Dec. 1, 2014 through Feb. 28, 2015, is based on an analysis of several large-scale factors in the land-ocean-atmosphere system. One factor is, as you might expect, the presence or absence of El Nino -- an area of warmer-than-average water in the eastern Pacific Ocean near the equator. While El Nino has not developed yet, WSI forecasters expect a weak to moderate El Nino to emerge over the winter months and potentially persist into the spring. The forecasters caution, however, that the resulting U.S. winter temperature pattern during an El Nino tends to hinge on what happens elsewhere in the atmosphere. One important question is how "blocky" the jet stream will be over North America. In other words, forecasters consider whether the jet stream will loop wildly north and south and tend to get stuck in patterns for long periods of time, or instead tend to blow from west to east and carry weather systems with their alternating warm and cold air masses quickly across the country. WSI forecasters point to an early buildup of snow cover across Eurasia -- and especially southern Siberia -- as a possible hint that the jet stream will behave erratically this winter. The forecasters note that WSI research shows a strong connection between October snow cover in Siberia and breakdowns in the stratospheric polar vortex during the mid-winter months. The authors believe the early snow cover may cause a tighter temperature gradient over Asia, strengthening the jet stream. Eventually that momentum may work its way up into the stratosphere, which in turn would knock weather patterns off balance around the Northern Hemisphere several months later. WSI forecasters looked at several other technical indices and long-range computer models that also point to an above-average chance of blocking patterns in the northern latitudes -- the kind of patterns that can force bitterly cold air from the polar and Arctic regions southward into the U.S.
WSI says that, based on conditions over the Pacific Ocean, the West Coast is more likely to be protected from those intrusions by a northward bulge in the jet stream -- known as a high-pressure ridge -- and that those cold air intrusions are more likely to be pointing toward the East Coast and the Deep South instead. November: Slightly cooler than average from New Mexico to Michigan to Georgia and points in between. Warmer than average elsewhere, but especially for the West Coast states plus Nevada, Idaho, and Montana. December: Slightly cooler than average for Colorado, New Mexico, the Plains states from Nebraska to Texas, and the lower Mississippi River Valley. Warmer than average elsewhere, but especially in California and southern Nevada as well as the East Coast states from North Carolina to New England. January: Cooler than average from Texas to Wisconsin and points eastward, but particularly cool from the southeast half of Texas east to the Florida Panhandle and inland as far north as the southern tip of Illinois. Warmer than average elsewhere, but especially over the Northwest, northern Rockies, and northern parts of California, Nevada, and Utah. Below average temperatures are favored in parts of the south-central and southeastern United States, while above-average temperatures are most likely in the western U.S., Alaska, Hawaii and New England, according to the U.S. Winter Outlook, issued today by NOAA’s Climate Prediction Center. While drought may improve in some portions of the U.S. this winter, California's record-setting drought will likely persist or intensify in large parts of the state. Nearly 60 percent of California is suffering from exceptional drought – the worst category – with 2013 being the driest year on record. Also, 2012 and 2013 rank in the top 10 of California’s warmest years on record, and 2014 is shaping up to be California’s warmest year on record. Winter is the wet season in California, so mountainous snowfall will prove crucial for drought recovery. Drought is expected to improve in California’s southern and northwestern regions, but improvement is not expected until December or January. El Niño, an ocean-atmospheric phenomenon in the Tropical Pacific that affects global weather patterns, may still develop this winter. Climate Prediction Center forecasters announced on Oct. 9 that the ocean and atmospheric coupling necessary to declare an El Niño has not yet happened, so they continued the El Niño Watch with a 67 percent chance of development by the end of the year. While strong El Niño episodes often pull more moisture into California over the winter months, this El Niño is expected to be weak, offering little help. The Precipitation Outlook favors above-average precipitation across the southern tier, from the southern half of California, across the Southwest, South-central, and Gulf Coast states, Florida, and along the eastern seaboard to Maine. Above-average precipitation also is favored in southern Alaska and the Alaskan panhandle. Below-average precipitation is favored in Hawaii, the Pacific Northwest and the Midwest. Last year’s winter was exceptionally cold and snowy across most of the United States, east of the Rockies. A repeat of this extreme pattern is unlikely this year, although the Outlook does favor below-average temperatures in the south-central and southeastern states. In addition, the Temperature Outlook favors warmer-than-average temperatures in the Western U.S., extending from the west coast through most of the inter-mountain west and across the U.S.-Canadian border through New York and New England, as well as Alaska and Hawaii. The rest of the country falls into the “equal chance” category, meaning that there is not a strong enough climate signal for these areas to make a prediction, so they have an equal chance for above-, near-, or below-normal temperatures and/or precipitation. The U.S. Seasonal Drought Outlook, updated today and valid through January, predicts drought removal or improvement in portions of California, the Central and Southern Plains, the desert Southwest, and portions of New York, Connecticut, Rhode Island and Massachusetts. Drought is likely to persist or intensify in portions of California, Nevada, Utah, Idaho, Oregon and Washington state. New drought development is likely in northeast Oregon, eastern Washington state, and small portions of Idaho and western Montana. This seasonal outlook does not project where and when snowstorms may hit or provide total seasonal snowfall accumulations. Snow forecasts are dependent upon the strength and track of winter storms, which are generally not predictable more than a week in advance.